The Haverford Music Festival committee is hard at work planning this year’s festival on September 7 from noon to 9:30 p.m. It’s an event that involves much more than music. This year, there will be four separate stages, including the big stages behind the Oakmont Administration Building and on Darby Road. There is a smaller outdoor stage on Eagle Road and a new indoor venue at the Rock on E. Eagle Road. There will be special fun activities for kids at the Oakmont location including a giant slide, and for the first time, the festival will have its own Beer Garden co-sponsored by the Haverford Rotarians. The Festival Beer Garden, also serving wine this year, will be located on Hathaway Lane just outside the main stage area. It will be fenced for safety and no alcohol will be allowed outside the fenced-in area. Festivalgoers must show proof of age before purchasing tickets to get beer or wine at the beer garden. All proceeds will support a special project at the Grange, one of the premier township historical sites. Roy Sandstrom, a volunteer who helps to manage the Grange, is overseeing the construction of a summer music venue at the site that is on the National Historic Register. Several years ago, when the township Rotary was a dinner club, the members were part of the community ground swell the helped to save the Grange, originally built in the early 1700s. The concrete footings for the Grange’s new amphitheater were poured on July 27 beginning the construction of a venue for “a broad spectrum of events,” says Grange volunteer Roy Sandstrom. All kinds of music, theater garden talks, even meetings and ceremonies could take place in what was considered the North Garden of the historic home. “This is a great partnership,” Kelly says. “Both organizations want to support the Haverford community. Helping the Grange complete its plan to have a designated space for music is a perfect project for the festival to support. It couldn’t have worked out better.” A portion of the funds raised by the music festival last year provided seed money for this project. Construction begins July 27. 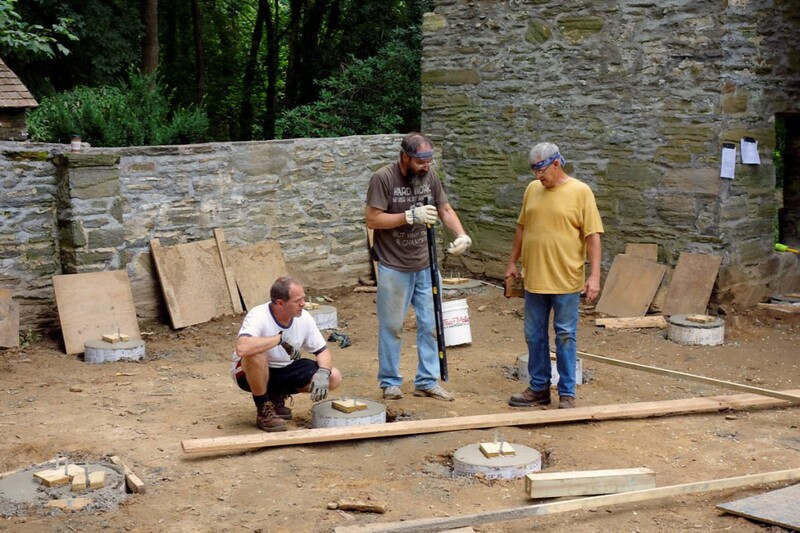 With the funds raised by last year’s Haverford Music Festival and other contributions from Grange supporters, the Amphitheater in the Grange’s North Garden began on Saturday. Grange volunteers Jay Jenkins (left) and Music Festival committee member Rick Miller (center) and Friends of the Grange president Bill Penn began construction.